“Mirror People” is the episode I’ve been wanting to talk about most since the pilot. It is probably my favorite out of the four I got to see early. The episode executes well, blending everything we’ve built-up regarding our story, along with providing a good amount of character depth. Atop of this, the episode delivers on what I’d expected from the series since the beginning: reckless youth, 80’s pop culture, fighting assassins, and coming of age drama. There’s a lot to admire about the detention episode. To begin, the dialogue sounds like it’s spoken from a 1980s teenager. Whereas I wasn’t one hundred percent sold in the tone of voice in the party or dance episodes, I think this one is a perfect harmony blending teenage angst, the desire for acceptance, and the right amount of sardonic riffing. Befitting for the Gen-X youth of the era. More importantly, there are some compelling emotional dialogues that capture not just the dramatic moments, but some of the fun throw-away liners too. Through good quality speech and banter, we get what these kids are going through: yes, they’re assassins but they’re also just teens. Still growing up and trying to have fun. The series, not shying away of utilizing the talents of its cast. We also get a good sense of character backstory in this episode. Chico lost a brother. Saya, is on the run from a very tumultuous family life. Billy wants to protect his family. Petra comes from a deranged occultist family. This is actuated by stellar performances from the entire cast. Chico is really on point, showing us his lighter (who knew that guy could be fun?) and darker sides – for a very well-rounded performance by Michel Duval. Marcus becomes surprisingly less complacent and highly chivalrous – never hesitating to help those in need. Even Saya finally shows some vulnerability, her cold demeanor finally some surprisingly warm depth in regards to her family. Now, Saya isn’t the easiest character to portray emotionally. 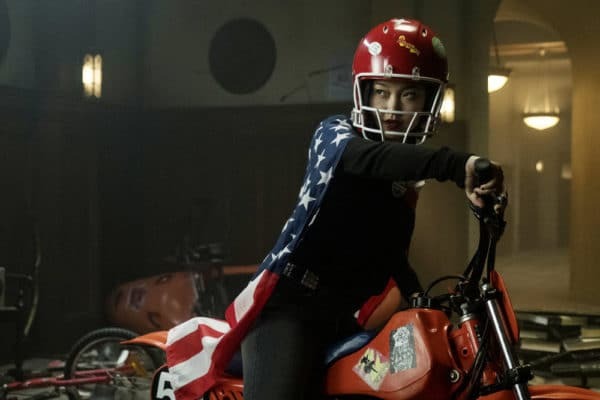 But Lana Condor does an excellent job. With a performance that’s a little unhinged and just outside the comfort zone of Saya’s normally calm yet devil-may-care demeanor. That’s the thing, this episode is incredibly precise in the details. Never wasting a second of screen time. Marcus and Saya’s budding romance. How it builds off the previous episodes, deconstructs it from Saya’s perspective, and circles back in organic fashion. Petra and Viktor’s failed romance and how it provides emotional depth in one of the series’ strongest scenes. The Detention crew messing around! It’s fun and fitting for each character. Plus, we get to see Chico and Marcus even put aside their differences for a friendly bout of sparring, American Gladiator’s style. The emotional tone in this one is also just stellar. From the sadness of Lin over what happened with Jurgen last episode, to the detention crew’s playful ‘Breakfast Club’ tribute, and even Petra and Billy’s side stories. 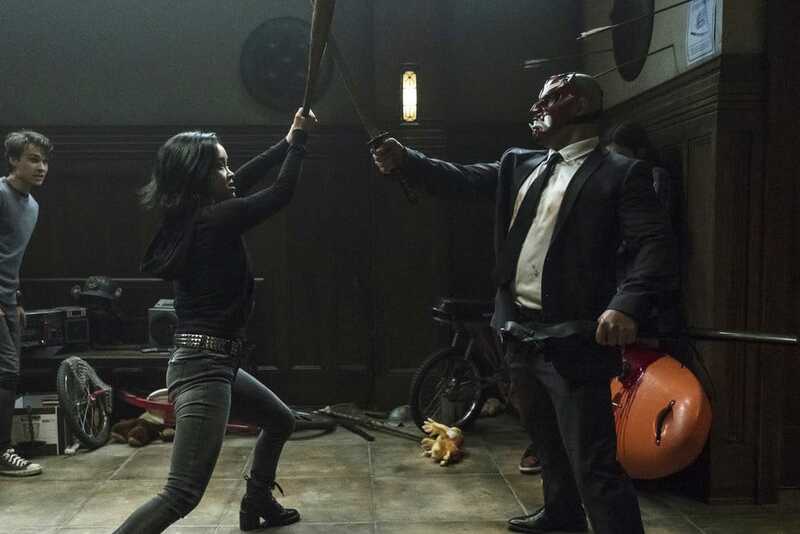 Even the fight sequences – the best since the pilot – are all weighted in related drama, with Saya’s family history hitting into each gut-wrenching punch and blade slash. Most importantly, this episode was great for the series’ tone because we finally see some death again. 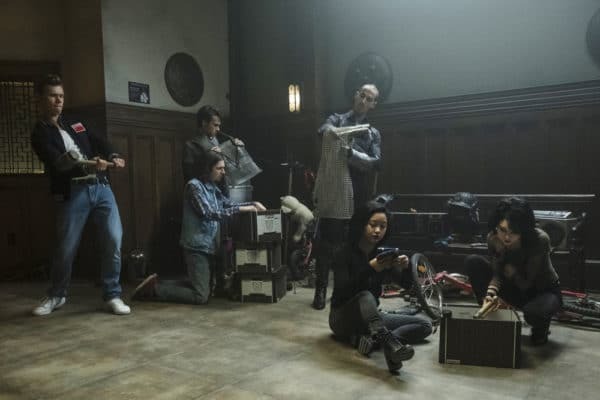 Even though we’ve been playing high school with the party and dance episodes, I think the audience needed a reminder that this is indeed a school for assassins – people will die in this tv show. There will be consequences. Overall, this episode executes on all levels. They couldn’t have done a better job. The only reason I don’t give this a perfect score is because I don’t think it is ‘game changing’ or redefining the genre. But as an episode of TV it’s as excellent as it can get. 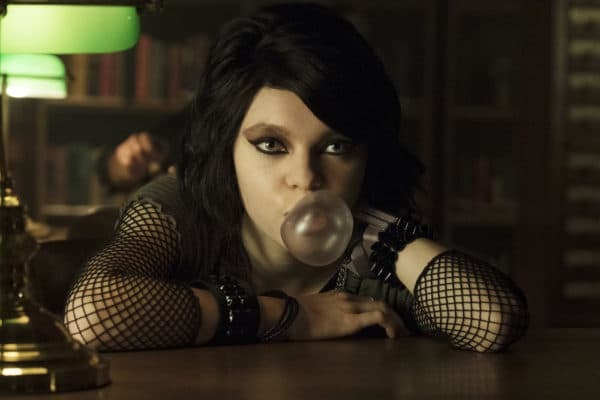 You can watch ‘Deadly Class’ Wednesdays at 10pm EST on SYFY. The episode opens on Dwight Shandy (Brian Posehn), the Hessian’s drug dealer from episode 2. He’s doing the ‘Risky Business’ slide while still partying at Shabnam’s house days later: all by himself. While making breakfast, he gets into a heated pop culture debate over the phone regarding ‘Risky Business’ berating the movie’s story but praising the sexual appeal of actress, Rebecca De Mornay. It’s a one-sided conversation. We can’t hear who he is speaking to, but Dwight eventually relents and curses his debate partner out, revealed to be… his mom. The doorbell rings. Dwight answers. It’s Marcus’ old roommate from the boy’s home at the door. At King’s Dominion, Saya trains with her Katana in front of a mirror. A monk approaches, taking her, Chico, and Viktor away to detention – which we soon learn is a two-day lockdown in the library as discipline for misdeeds against the school. It’s also a convenient opportunity for the show to do a parody of ‘The Breakfast Club’. 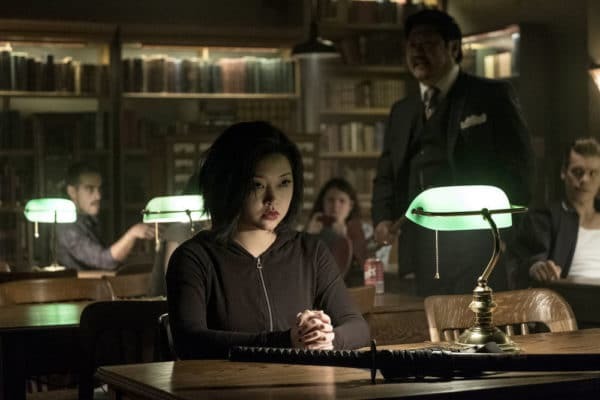 As they are escorted, the Asian kid with orders to act on Saya (end of the last episode), now revealed to be Yukio, tells a man over a payphone that the students will be at the library. At detention, Master Lin is upset. Not because of what they did, but because everyone in detention had gotten caught. He has the monks confiscate their objects – Petra’s soda, Chico’s knife, and Saya’s sword. Lin heads upstairs with Saya’s blade. In the diner, every staff and patron is armed with a sharp weapon. As he leaves, he tosses Saya’s sword to a trusted guard for safekeeping. Outside, Willie meets up with Maria who asks him to make her a passport. She acknowledges he’s locked up for two days in detention and that this is the chance she has to get away from him. Billy receives a call from home with some concerned news. His little brother telling him that creeps are wandering by the house again. He goes home for the weekend to fix things, finding his home in disarray. We meet Billy’s family: a mother and little brother looking on hard times. We also meet his father slightly off-screen. He’s a big guy, who’s not the nicest of characters. Back at the library, everyone is bored and looking for ways to pass the time. The banter and scenes here are refreshing and fitting – seemingly pointless but is actually good character building. Viktor does pushups. Marcus makes fun of Viktor’s many Swatches. Chico gets more-and-more hotheaded. Saya is concerned over her sword. The group then gets philosophical, debating on the nature of empiricism and free-will, again – all character building. They do agree on one thing though: hunger. As there’s apparently, only one chest of food for the weekend – which apparently contains only two tiny bags of chips. Petra shares a tale about the contraband storage area. It interests the detention crew, but more so Saya than anyone else, as she thinks her sword is probably there. Saya tries to kick down the door but fails. Marcus picks the lock for her, sharing his obvious opinion: that Saya is in love with him. Saya reveals that he is her pledge: she’s tethered to him and any trouble he gets into she is punished for too (hence, why she’s in detention). The group breaks out. Viktor debates with Chico about the mechanics behind Robocop in a funny scene. Petra tries explaining it to him, but it just confuses Viktor more. Marcus talks to Saya and tries understanding how pledges work. He’s skeptical, because if she doesn’t care for him, why is she breaking the rules with him right now if she could be punished even more? Saya follows Bushido – she lives and dies by her sword and refuses for it to be locked in some closet. Petra leads them to the confiscation vault. Marcus picks the lock. Surely enough, it’s all there: the spoils of everything ever confiscated at King’s Dominion. The group goes to town indulging on the loot. Saya notices her sword isn’t there. At the upstairs diner, we notice two men in Oni masks approach: it’s a showdown. The guard with Saya’s sword draws her blade. After the break, Chico and Marcus battle American gladiator style. An ecstatic Viktor finds a grenade hidden under several layers of a Russian doll. Soon after, Marcus and Saya share some intimate Smalltalk – he’s trying to cheer her up as everyone is having fun except her. Saya is still upset about her katana. Marcus finds a small motor bike and has an idea to cheer her up. Moments later, Marcus and Chico take bets on whether Saya can Evel Knievel jump over a makeshift spike pit they built. Of course, she pulls it off, showcasing the badass Saya is. Enjoying herself, she asks the gang if they can make it bigger. While playing with more contraband, the detention crew makes more Smalltalk. Chico surprisingly puts on a cassette tape from “The Cure”. He mentions that it was brother’s favorite album… at least, it was, before he died. Marcus apologizes for bringing it up. Chico mentions how could he understand, as he and Marcus come from different worlds. Jaden, the Hessian who’s remained mostly nameless and who put Billy’s fingers in a mousetrap last episode, is about to try and jump the same spike pit Saya had. He counts down with the fingers on his left hand before hitting the throttle but before he can reach one… he loses the entire hand via Saya’s Katana. 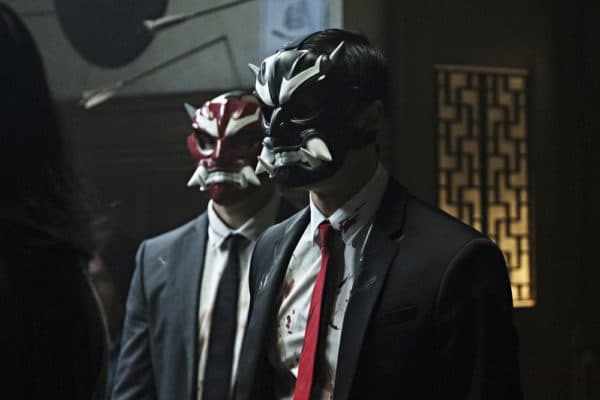 The two men in Oni masks have arrived. One is wielding Saya’s sword taken off the guard from upstairs. They begin fighting with the group, but it only takes seconds to realize the teens are severely outmatched. Viktor is cut across the abdomen. Petra is stabbed in the back. With three of the gang bleeding out fast, Saya orders everyone runs. They retreat to the library, but not before Chico tosses Jaden behind and leaves him to the Oni men. Jaden gets murdered in front of Marcus, who then gets in the library and locks the door. Inside, Marcus is furious at Chico for getting Jarden killed. Chico reasons that he had to be left behind otherwise they’d all be dead. Everyone is panicking. Saya reveals that the two men are Kuroki Syndicate – cousins that are looking to take Saya home, as she left on bad terms. Chico is more than willing to give her up. Marcus refuses to surrender, reasoning that once they have Saya – there’s no reason for the Kuroki not to murder the rest of them. Angry, Chico starts trashing the library. He finds a secret. While trying to come up with a plan, Marcus and Saya realize Chico’s missing. They find the vent, which is now open. They follow it down a hallway and find Chico, who closes the exit gate in on them and locks it – wishing Saya well on “The family reunion”. In the library, Petra lies next to a dying next to Viktor. She shares her backstory. Her life used to be normal until father found a ‘New God’ and became a crazy cult leader. He gauged Petra’s mother’s eyes out, then forced Petra to watch as her mother died. Viktor wonders why she’s sharing this story. Petra believes they’re going to die there. Saya mentions she needs to get her Katana back from her cousins and tells Marcus to find help for the others. Marcus tells her she’s insane for going after the sword at a time like this. She mentions it’s the only thing left of her father. Marcus refuses to leave her and let her die but is suddenly slammed into a wall and knocked out. The cousins use a sleeper hold on Saya, saying that her brother is expecting her. At the dorms, Willie hands Maria a comic containing a passport. 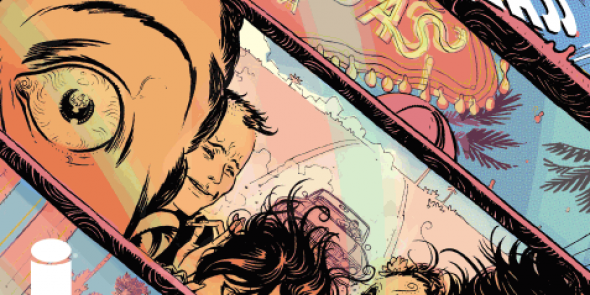 He tells Maria not to tell Marcus he was reading any of his independent comics. Seconds later, as Maria rushes into her dorm – Chico is there waiting for her. She is startled, but is deft enough to hide the passport in her back pocket as she pretends to gift the comic to Chico. Lin arrives back at the diner to find his heavily armed guards dead and scattered everywhere. He then bars the exit, as the two Kuroki arrive carrying Saya. Lin arms himself with a nearby sword and gets ready for a showdown. In ever surprising fashion, Marcus jumps the one carrying Saya and bonks him on the head with a frying pan. He drops Saya and her katana, which she soon picks up and wields with great proficiency. Master Lin battles the Kuroki wielding two scythes, while Saya battles the other one who picked up a spear he’d found lying on the ground. Marcus helps Saya in the battle using an unconventional style of mostly dodging and throwing objects in the way. It’s an intense fight on both sides. Eventually, Marcus is able to get behind and disarm the spear-wielding one, as Saya stabs him in the heart with her Katana (with great skill as she apparently avoided stabbing Marcus). She breaks down in tears soon after. The other Kuroki member leaves. Petra and Viktor are wheeled out in stretchers by the Monks. So is a deceased Jaden. A vigilant Yukio, the spy assigned to watch Saya, watches on from the hallway as they wheel past. At the graveyard, Saya drinks. Marcus offers to be there for her but only if she wants. She mentions that her cousin was hard on her throughout her entire life, but only because he wanted her to be great. She hated him for it, but it worked. She’s conflicted about killing him. Marcus tells her it’s not supposed to feel good. 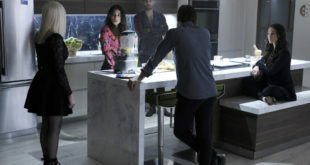 Saya tries to confess that at Shabnam’s party… but Marcus cuts her off and playfully tells her “When you tried to kiss me.” Saya says Marcus clearly misunderstood. His hand edges closer to hers. She holds it and it’s oddly comforting. The camera turns to see Dwight in chains like a dog in chains (a subtle nod to the comic). Marcus’ old roommate holds Dwight on a chained leash. At the dorms, Marcus goes to check up on Billy and update him about what happened. Billy’s face is severely bruised. He admits to Marcus that he’s at the academy because his dad owes the mob a million dollars, so Billy is being trained to work for them to pay off his father’s debt. Yet when he arrives home, Billy finds his father in even more debt from gambling. Billy calls him out on it and his dad gets angry, so Billy tries to leave. His dad stops him and then gets abusive. First, by slamming his mom, who tries diffusing the situation, into a wall and then by getting on top of Billy and beating him relentlessly with his many ringed fist. Billy admits he found an opening and got on top of his father but couldn’t find it inside him to hurt him. Marcus tells him he’s just a kid who still loves his dad. Billy admits that his mom and brother are not going to survive his dad. When Marcus asks what they can do to help? Billy offers they take a road trip to Vegas. To kill his dad. Thus, beginning the craziest arc of the beginning series.